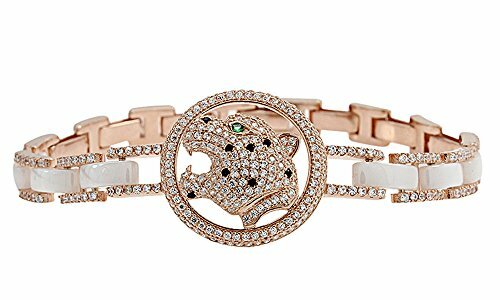 Jewelry has the power to be this one little thing that can make you feel Unique, You're going to love this Panther Leopard White Ceramic & Cubic Zirconia Bangle Bracelet Rose Gold Over Sterling Silver . Absolutely a great gift to express your love for your mother, girlfriend, fiancee, wife, valentine, family or just a friend,etc. Great gifts on Mother 's Day, Wedding, Anniversary day, Valentine's Day or Christmas Day. It features Fully paved with shinning CZ which will make a timeless accessory to any jewelry collection. This Eye catchy Bangle Bracelet to draw all the attention from your friends.